Absolutely stunning case. Has the craftsmanship you'd expect from corsair. Some don't like the white corsair front and side logo but matches my white,red, black build perfectly. Comes with three sp120 fans and controller which is part of the hefty price I'd assume. The white version is only available on Newegg and adds a whole with grommet in the PSU cover though I would have been great if they had put another one. Like the first 570x, they still don't cover the other opening of the PSU cover for whatever reason. The cable management tray in the back is nice but wish it was a bit wider since all cables that run through the front grommets have to make their way through the tray. Running cables isn't hard but isn't super easy either depending on what you need to wire up. Like most new cases, no spot for a CD drive but externals are dirt cheap so whatever. Other than those grips, I'd recommend this case to anyone that wants a really clean build. 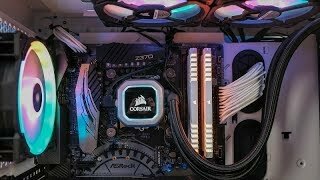 -Case: 570X Corsair Crystal RGB : If I can give you any advice it's to stay away from this case. I found it very hard to build in. Especially, with two GPU's. As you can see my cooler rests against my top GPU. Also there is no space in the back for cable management. The pros, well it looks nice and that's about it. I will be looking to replace this case as soon as I can or hopefully when the HAF500P comes out. I'm still sour about this case, but it's cool for now. This case looks amazing. Only draw back is the challenge of cable management which of course is displayed with the tempered glass. This is hands down the most beautiful case Corsair has ever made, and easily the entire reason why I got myself back into PC gaming after a long hiatus. I actually saw the black version of this case on display at my local parts store and I just.. I needed it. And I wasn't willing to wait for it either, even though at the time the case still hadn't reached inventory status at the shop. Since then I've been the biggest fan of Corsair by far. The case has some minor quirks but is a joy and a pleasure to build in. I just wish they included the PSU shroud addon as part of the case, not an additional addon you must order directly from Corsair themselves. Loving this case! Very spacious and the white makes everything very easy to see! I wish the cable management channel in the back was just a touch larger, and it really needs a cover at the end of the PSU Shroud. Plus the ability to control the color of the Corsair logos on the front and side would be nice, but overall this case has the room I need to grow and eventually add a custom water loop! Absolutely gorgeous, glass panels look amazing, showcases your lovely build. Cable management a bit tight at the back, specially with power cables behind the white metal 'case', however can make it work. Otherwise everything I wanted in a case. Prettiest case I ever did see. Did have some mounting issues with my massive, oddly-shaped CPU Cooler as discussed above. Not sure if I should blame the case for having an indented rear exhaust fan mount or the CPU Cooler having the oddest shaped heatsink possible. Cable management, as anyone would expect in a 4-panel Tempered Glass case, was complete ***. But it's doable and looks amazing afterward, even if it's tough to make sightly. The included RGB SP120 fans are pretty, ended up putting them on my Corsair 400R instead of selling them because I liked them so much. Placed LL120s in all 120 mm fan slots. Much wow. Ventilates surprisingly well. The case I received had a closed-off PSU shroud and a cutout in the PSU shroud so that you could route cables more easily. This is a significant improvement over the original Corsair 570x which oddly enough did not include these basic perks. Very affordable if caught on sale with a rebate or with additional items. I've seen it as low as $140 with a $60 AIO as a gift. With a $60 pack of RGB fans on it. That's a $20 case. A top-end name brand 4-panel Tempered Glass case. Incredible deal. love this case but if Corsair did a white version of the new 500D SE then I'd be in there like a shot! Best looking case on the market in my opinion. Easy to work in, and has a lot of cooling options for $130. The power supply aground is fully cutoff, giving the build a clean look.